A place for your fur-children! Paw-some dog is a cage-free dog daycare and boarding facility located in the heart of west Los Angeles. We love dogs! In a cage-free environment, we are a dog daycare and boarding facility in the heart of West Los Angeles. We take care of your dog, as if they are our own. We only want to make you and your dog happy and we know how hard it is to trust someone to take care of your dog. Our goal is to make sure your dog is having the best time! Paw-some Dog offers Cage-free Daycare which allows you not to have to spend the day away from your pup. Drop off in the morning and pick up your dog at night before you go to bed. During the day our dogs are divided by temperament and split between the first and second floor. Let them play all day so they come home nice and tired for you. Need to drop off your pup before your early flight? At Paw-some Dog, we allow you to drop off or pick your dog up at anytime. We know your schedule can be a little hectic, and we are here to help. Even if the lobby is closed you can still get your dog by calling our number and meeting a staff member on the side door. Cage-free offers your dog a unique way to stay with a person. At night, all our dogs go up stairs in an AC and heat controlled room, and sleep with a staff member watching and cleaning up after them. We do love to cuddle too! 100% cage-free environment for dogs. 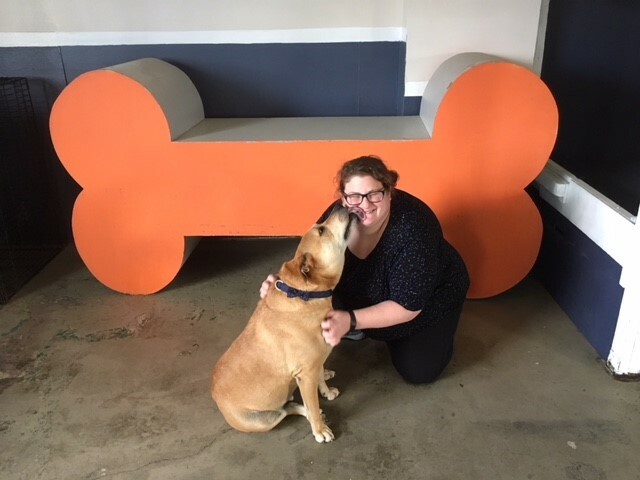 Originally called The Loved Dog, Paw-some Dog acquired the business in January 2018. Everything, except ownership has stayed the same including all the staff and many customers. We truly love dogs and value them as a part of the family. With keeping on The Loved Dog method, we treat your dog as if he or she is our own. We have two floors to split up the pack during the day, and at night all our dogs sleep together in a open room with a staff member. We have staff on-site 24 hours a day and 7 days a week. We are also open 365 days a year. We look forward to meeting you and your pup! Hi - I'm Julia and happy to meet you! I speak dog, I know dog's behavior, and I have a ridiculous amount of knowledge on dogs. I love dogs and your dog will be treated just like my own. Dogs have been a life passion of mine. I started working at PetSmart studying dogs, while I was a student at Arizona State University. I graduated with a degree in business and communications and minored in Film and Media production. While continuing my work at PetSmart, I moved out to Los Angeles. Since 2015, I have successfully ran another doggie daycare and boarding facility near LAX. I know how important a dog is. They're not just an animal. They are our best friends, our child, a member of our family. I got my dog, Mojo, right before I moved out to California. He came up to me on the grounds of on an Indian reservation, and the rest is history. From my own personal experience, I know how hard and important it is in finding a place where you feel comfortable leaving your dog.